Dark skies were threatening rain over the Kurdish village in northern Iraq, but one woman refused to budge from outside the front door. Inside were two girls at risk of genital mutilation. Syrian rock bands fleeing war are finding safety and new fans in neighbouring Lebanon, where they are revitalising a Westernised scene with their focus on Arabic musical heritage. Dozens of Syrian bands and independent artists have now become mainstays of the Beirut music scene, performing emotive and often bleak songs in front of concert-goers eager for fresh faces. KFAR RUMMAN — THE excruciating wail could be heard without the microphones. On November 14th, thousands of women clad in black abayas and children watched the army of the caliph Yazid slaughter Hussein, a grandson and would-be heir of the Prophet Muhammad, in a theatrical recreation of the battle in 680 AD that split Islam into its Sunni and Shia branches. 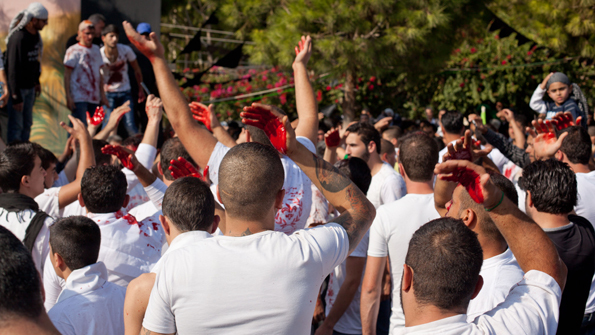 Below the stage in this town in southern Lebanon, groups of young men prepared themselves for a bloodier part of Ashura, as the day of mourning for Hussein’s death is known. Men used razors to carve small incisions on the scalps of the men and boys, some as young as two-years-old. Cries of “Ya Hussein, Ya Hussein” echoed through the streets as men pounded their foreheads, blood streaming down their faces.